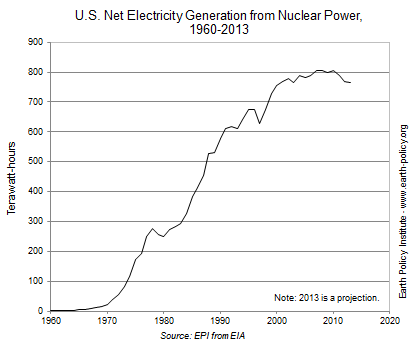 Nuclear power generation in the United States is falling. After increasing rapidly since the 1970s, electricity generation at U.S. nuclear plants began to grow more slowly in the early 2000s. It then plateaued between 2007 and 2010 - before falling more than 4 percent over the last two years. Projections for 2013 show a further 1 percent drop. With reactors retiring early and proposed projects being abandoned, U.S. nuclear power's days are numbered. The nuclear industry's troubles began well before the 1979 accident at Pennsylvania's Three Mile Island nuclear plant sowed public mistrust of atomic power. In 1957, the country's first commercial nuclear reactor was completed in Pennsylvania. By the mid-1960s, excitement over an energy source predicted to be too cheap to meter had created a frenzied rush to build reactors. But utilities soon pulled back on the throttle as the realities of construction delays and cost overruns sank in. Annual orders for new reactors, which peaked at more than 40 in 1973, fell sharply over the next several years. The two reactor orders placed in 1978 would be the last for three decades. Of the 253 reactors that were ordered by 1978, 121 were canceled either before or during construction, according to the Union of Concerned Scientists' David Lochbaum. Nearly half of these were dropped by 1978. The reactors that were completed - the last of which came online in 1996 - were over budget three-fold on average. By the late 1990s, 28 reactors had permanently closed before their 40-year operating licenses expired. A number of factors played a role in this, including cost escalation, slower electricity demand growth, and a changing regulatory environment. Despite these closures, the United States was still left with 104 reactors totaling some 100 gigawatts (100,000 megawatts) of generating capacity”by far the most of any country. Then, spurred on by new tax credits and loan guarantees promised in the 2005 Energy Policy Act - as well as by high prices for natural gas, a competing fuel - the industry has recently had visions of a nuclear renaissance. By 2009, utilities were planning more than 30 new reactors. But in the years since, the vast majority of these plans have been shelved. Even with huge subsidies, private lenders still see new nuclear projects as too risky to finance. Meanwhile, the U.S. shale gas production boom sent natural gas prices plummeting, further darkening nuclear's prospect. In 2012, the U.S. Nuclear Regulatory Commission (NRC) approved four new reactors for construction, two each at the Vogtle plant in Georgia and the Summer plant in South Carolina. These reactors are all of the same commercially untested design, purportedly quicker to build than previous plants. Both projects benefit from fairly new state laws that shift the economic risk to ratepayers. These advanced cost recovery laws, also passed in Florida and North Carolina, allow utilities to raise their customers' rates to pay for new nuclear plants during and even before construction - regardless of whether the reactors are ever finished. Construction at both sites began in March 2013. Even as the first concrete was poured at the $14-billion Vogtle project, it was reportedly 19 months behind schedule and more than $1 billion over budget. The Summer project, a $10 billion endeavor, also quickly ran into problems. In June its owner, Scana Corp., admitted that it was running about a year behind and faced $200 million in additional costs. With these delays, the earliest projected completion date for any of these reactors is some time in late 2017. The only other reactor currently under construction in the United States is Watts Bar 2 in Tennessee. It broke ground in 1972 and, after being on hold for two decades, was finally scheduled for completion in 2012. But that year, the owner - the Tennessee Valley Authority - announced it would be delayed again until 2015 and that the cost of the project would rise by up to 80 percent, to $4.5 billion. Several utilities have recently dropped plans for new reactors or for uprates, where an existing reactor's generating capacity is increased. For example, in May 2013 Duke Energy suspended its application to the NRC for two proposed reactors in North Carolina, citing slow electricity demand growth. Then in August, Duke pulled plans for a two-reactor, $24.7-billion project in Florida, on which it had already spent - and mostly recovered from its ratepayers - $1 billion. The company worried that mid-2013 amendments to the state's advanced cost recovery law would make it more difficult to fund ongoing projects with higher customer bills. In June, the nation's largest nuclear utility, Exelon, canceled uprate projects at plants in Pennsylvania and Illinois. (These are two of at least six uprates dropped by utilities in 2013 as of early September.) Just over a month later, the French utility EDF announced it was bowing out of a partnership with Exelon that operates nuclear plants in New York and Maryland. In fact, EDF will no longer pursue U.S. nuclear projects at all, instead focusing its U.S. efforts on renewables. More closures will soon follow, particularly among the roughly half of U.S. reactors in so-called merchant areas where nuclear competes with other technologies and prices are set by the market. A 2013 report by Mark Cooper at the Vermont Law School indicates that there are nine merchant reactors that, like Kewaunee, were granted 20-year life extensions but are especially at risk of closure. Epitaphs are already being written for two of them: Vermont's lone nuclear power plant will close in 2014, and the country's oldest reactor, Oyster Creek in New Jersey, will retire by 2019. Regulated areas, where state authorities set electricity prices such that nuclear operators are guaranteed a profit, contain the rest of the U.S. reactors. Even for many of these plants, the economics may not allow for survival much longer. According to Credit Suisse, the cost of operating and maintaining the aging reactor fleet is rising at 5 percent a year and the nuclear fuel cost is growing even faster, at 9 percent annually. Wind and solar power costs, on the other hand, continue to drop as their electric output grows rapidly. Dealing with nuclear waste is another expensive proposition. Over the past 30 years, the U.S. government has spent some $15 billion trying to approve a central repository for nuclear waste, and for most of that time the only site under consideration has been Nevada's Yucca Mountain. Amid concerns about the site's safety and its extreme unpopularity in Nevada, the Obama administration has moved to abandon the project entirely and explore other options. A federal appeals court ruled in August 2013 that the NRC must resume reviewing the site's suitability. In the meantime, the waste keeps accumulating. The 75,000 tons of waste now stored at 80 temporary sites in 35 states is projected to double by 2055. All this has implications for nuclear power's prospects for expansion: nine states, including California, Connecticut, and Illinois, have prohibited new nuclear plants until a solution to the waste issue is found. The low level of liability for nuclear operators in case of an accident also puts taxpayers on the hook. Plant owners pay into an insurance pool of just $12 billion; the public would cover any further damages. For comparison, cleanup and compensation for the 2011 Fukushima nuclear disaster in Japan is projected to cost at least $60 billion. The Natural Resources Defense Council estimates that a catastrophic accident at New York's Indian Point plant could cost 10 to 100 times that amount. This risk will be underscored on September 29, 2013, when one of Indian Point's two reactors becomes the first ever to operate with an expired license. If the reactors now under construction in Georgia and South Carolina actually come online, they are projected to generate electricity that is much more expensive than nearly any other source, including wind and solar power. New nuclear plants are simply too expensive to replace the aging fleet. And with uprate proposals for existing reactors being pulled, it appears the industry cannot depend on this option to increase capacity much either. The NRC has approved 20-year operating life extensions for more than two thirds of existing U.S. reactors; most of the rest will probably be granted extensions as well. Even if these units reach the end of their licensed life”which past experience says is unlikely”if no new plants come online to replace them, the last U.S. reactor will be shut down by the late 2050s. Any industry hopes ride heavily on the success of the Vogtle and Summer projects. As U.S. Energy Secretary Ernest Moniz said in a recent interview, if these plants now under construction keep racking up huge cost overruns and delays, it is very hard to see a future for nuclear power plants in the United States. By J. Matthew Roney. Data and additional resources available at www.earthpolicy.org. Photo credit: Jim Muckian (cc). 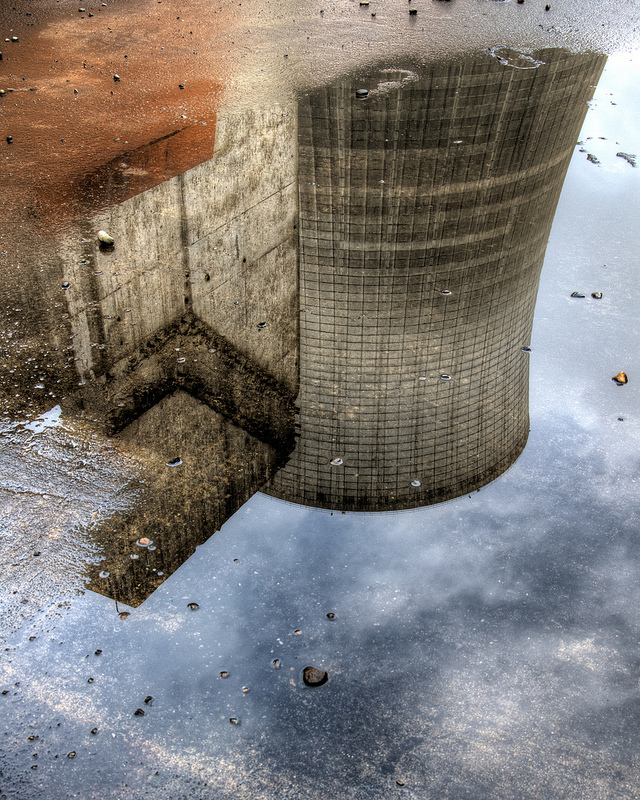 The photo shows a reflection of the abandoned nuclear power plant in Elma, WA.